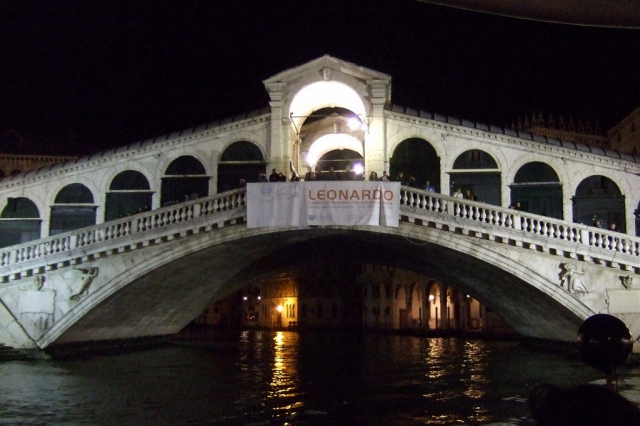 The Rialto Bridge is arguably one of the most recognisable landmarks in the entire city of Venice. It stands proud over the Grand Canal linking the city with its commanding stone steps. This year 5 million euros were designated to start on a new restoration project to continue protecting the bridge. This article is a small tribute to this legend of stone and mortar. When in Venice you must make time to appreciate this bridge. You may be thinking, why? Because it is a bridge that has held the city together since its first pole was driven into the soil. 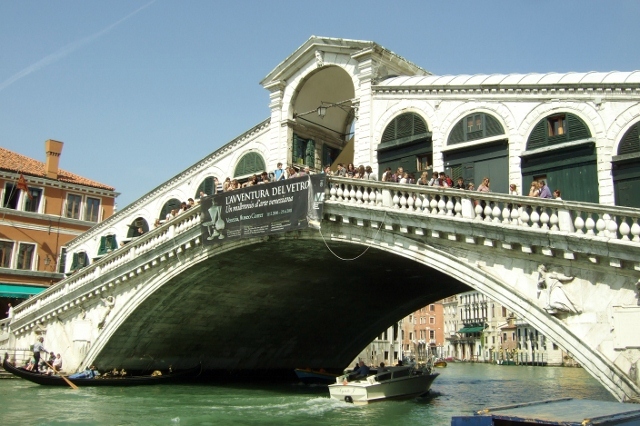 The current bridge built in 1588 stands in limestone, sporting carvings of saints, giving us a glimpse into the glory days of Venice’s contribution to the Italian Renaissance. But she is more than just stone; she is the city. 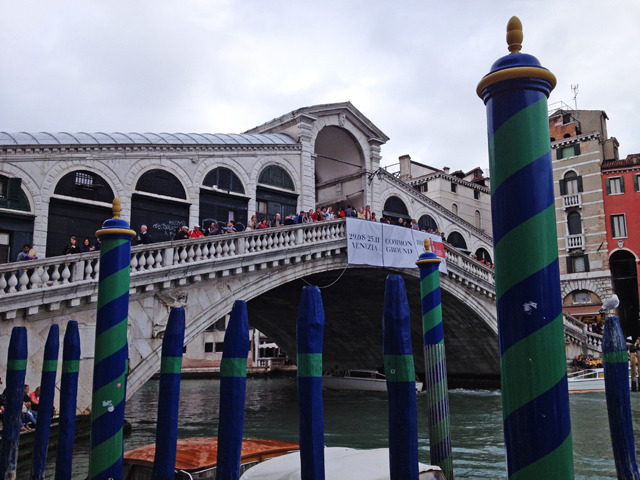 There has always been a Rialto Bridge; it is the oldest bridge on the canal. 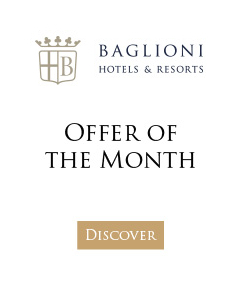 For centuries the Rialto has been the centre of trade and business. Markets, shops and currency exchange stalls stood upon and around the bridge welcoming all visitors and traders to the Venetian empire. Today as you walk along the narrow streets you can still see these same shops and stalls standing, containing the trading that has always been the shadow of the Rialto’s past history. My advice is to stand a while, watch, and listen to footsteps, the exchange of euros, and the laughter and joy of all those around the bridge. It’s an odd feeling. You might feel ghosts of medieval traders passing by, arm in arm with their ancestors of trade. When you walk upon the steps, and pass the shops and stalls, look upon the water. 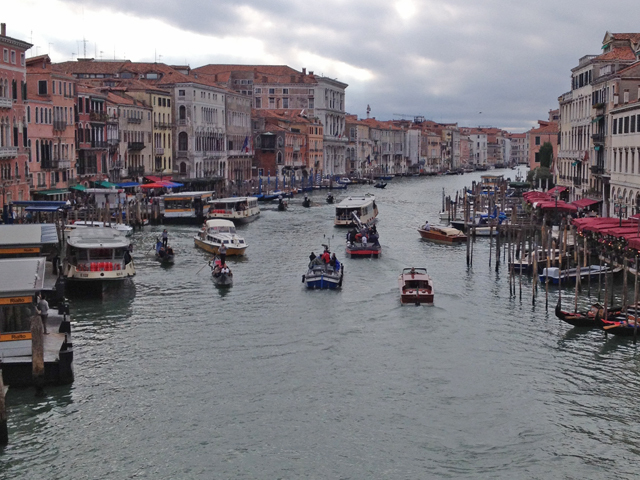 The Rialto Bridge gives you the most amazing view of the city. Your eyes look upon the grandest of homes from many centuries, and you can watch the boats and gondoliers travel up and down the calm waters. It’s almost like the Rialto gives you a window into the city’s past. The bridge has been built, knocked down, rebuilt, remodelled, conserved and renovated, but the history and myth of the bridge has always stayed the same. She has always beckoned ships and boats under her arches. She has always helped the greatest nobleman down to the poorest of merchants reach one side with ease. She has always watched festivals, ceremonies and been part of the city’s failures and victories. My words do not do it justice. No words can describe the feeling you get when you look upon her façade. The only way you will know is if you go; go and walk over her arches, past her shops, and speak to her people. Sit down at one of her cafes, watch, listen and learn and you will see a tradition of trade take place. 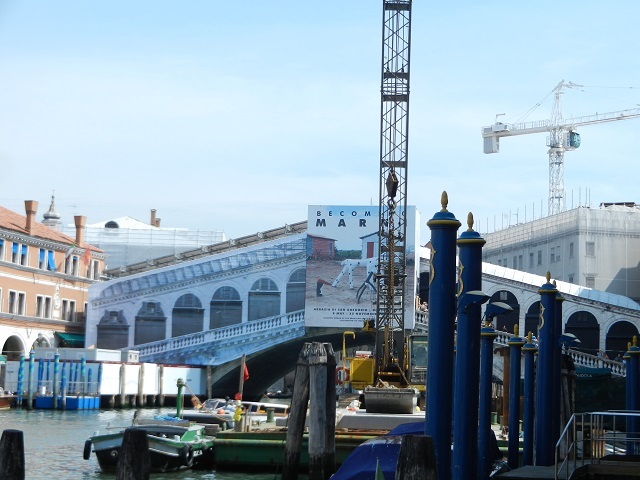 The world across the lagoon may have changed, the internet may have expanded, and phones connecting the world may have advanced, but somehow, some way the Rialto Bridge has managed to become untouched from the modern world. She is, like the whole of Venice, an artefact lost in time. The news of her restoration has fallen upon happy ears, because her story is too important to lose. Aaron is a Heritage Professional, writing and commenting on how governments and organizations protect and conserve our global heritage. He is a duty manager at a historic house in Bath. 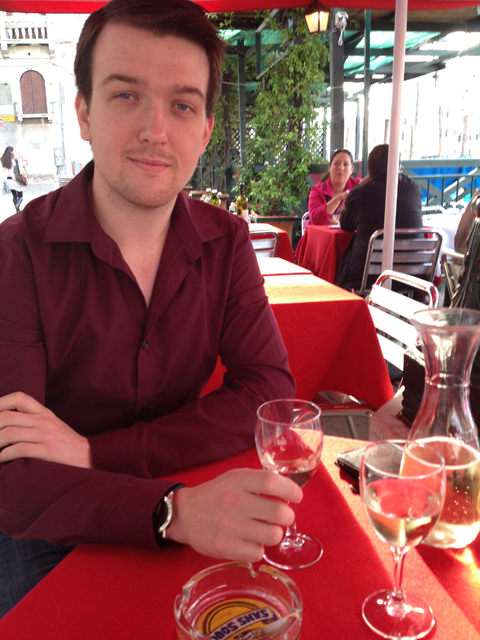 Follow him on Twitter and read his blog on Venice at Keys to Venice.